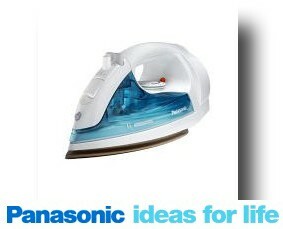 This Wonderful panasonic electric auto shut-off iron has been the best iron I have ever used. I have had it for about 5 years and use it daily. My favorite feature about this model is that it has a steam button. When pressed a huge stream of steam is released. When done next to an item that has wrinkles in it,it makes all of the wrinkles disappear. This is extra special when you have curtains hanging and you want to take out the wrinkles. They look like they just came from the cleaners. I have had many irons in the past that claim to have this feature, however none of them have ever come close to what this iron can do. This iron also has six settings from a light iron to a deep heavy iron. It also offers two other normal steam buttons, one for lesser steam and the other for more of full steam. This is used as you are ironing to help take out the heavy wrinkles. Another feature is the removalable water canal. This water holder pulls right out when you release a button, it enables you to bring it over to the sink and fill up the tank so easy. Then you place it right back on the iron and begin to iron your clothes. It also has a spritzer button for when you need to spray a little extra water for more steam and hard to get out wrinkles. The retractable cord is also a fantastic feature. All you have to do is press a button and the cord automatically pulls in. I can't tell how annoying it is to have to wrap the cord around a hot iron each time you finish ironing. This feature allows you to retract even if the iron is still hot. It is also very light weight so it makes it very managable. Join in and write your own page! It's easy to do. How? Simply click here to return to Panasonic clothes iron reviews.